I indicated the source as “US Census Data,” but I should have been more specific as one comment suggested that since the “census” is only done every 10 years that these numbers are completely made up. These numbers come from the American Community Survey and they are updated annually. A small number of responses were of this type. They said that the ACS is a survey and there is insufficient data to reflect a real decline. 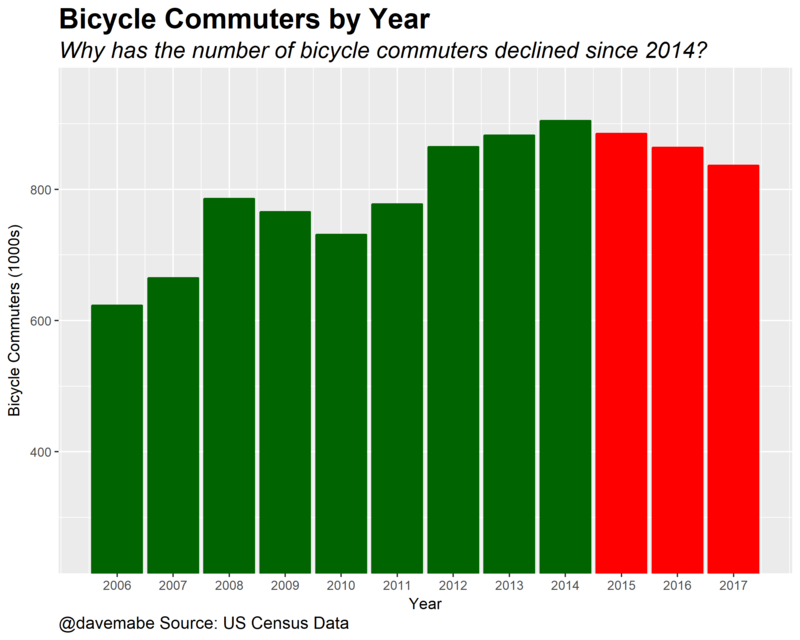 It’s theoretically possible that the numbers for the last 3 years are erroneous and that the number of bicycle commuters is actually growing, but I doubt it. The ACS is commonly used by cycling advocacy groups to point to successes – see this report by the League of American Bicyclists (LAB) which comes from the ACS data. In general I think the LAB’s approach is a good one – attempt to measure municipalities’ cycling friendliness score and then use the ACS data to report successes. This can be a powerful argument for cycling advocacy – sprinkle some cycling infrastructure improvements and watch it grow. Given the success in building cycling infrastructure in lots of areas in the US, are we bumping up against a theoretical ceiling for cycling? I don’t think so but I admit these ACS numbers make me less sure. One comment suggested that looking at bicycle sales numbers as evidence that the decline is an anomaly. A quick search for those numbers doesn’t look optimistic to me. A few comments suggested looking at workers’ commute times which are, in fact, increasing over time. Interestingly I couldn’t find any data on commuting distances. I would imagine that there should be data that analyses congestion over time by looking at commute times and commute distances over time. By the numbers, all of the new workers over the last several years are choosing to commute by car. They apparently aren’t bothered too much by the longer commutes/congestion or maybe they don’t feel like they have a choice. As commutes get longer, at some point along that continuum the choice to bike to work is no longer a realistic option. This is not something I thought of prior to writing the post, but this makes a lot of sense. The areas where cycling infrastructure is excellent or improving are also affected by the housing crisis. Could it be that local zoning laws are indirectly working against cycling? Seems like a reasonable theory worth exploring. Also, it is much harder to text on your phone when cycling, versus Uber (or even sneaking in texts at stoplights). For the ‘connected generation’ on-road cycling may be an unacceptable interruption. If they want exercise they can use a stationary cycle. This seems logical to me although I have to way to verify it or gauge how important its effect is. I’ve always thought of this as an advantage to riding a bike, not a downside. I’m sure not everyone feels the same way. lenore skenazy and i found some data on the sharp decline in biking to school for kids, i think it happened in the 1990s. 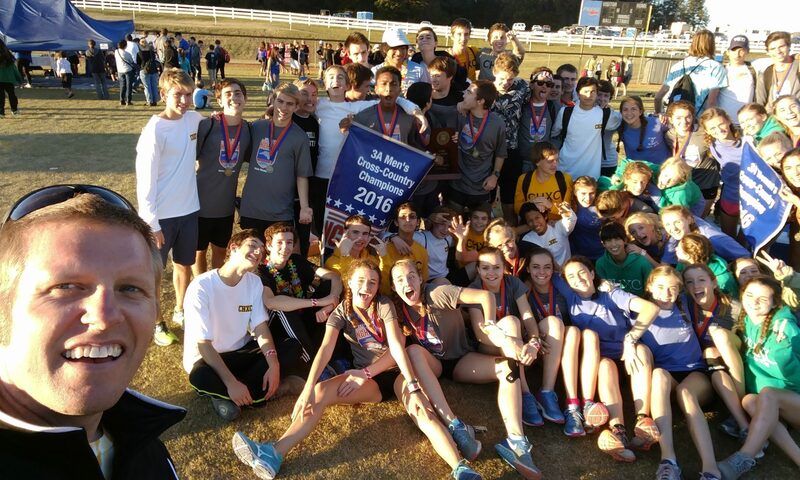 2015 would not be a special year, for adults; it was special on campus. i would not interpret the 3 year decline for adults as anything yet, could be random fluctuation. unless you can get data broken down by age. if you find no change for those over age 30, but yes for under 25, then it is Gen Z.
I looked for data on bicycle commuting and age via the ACS. 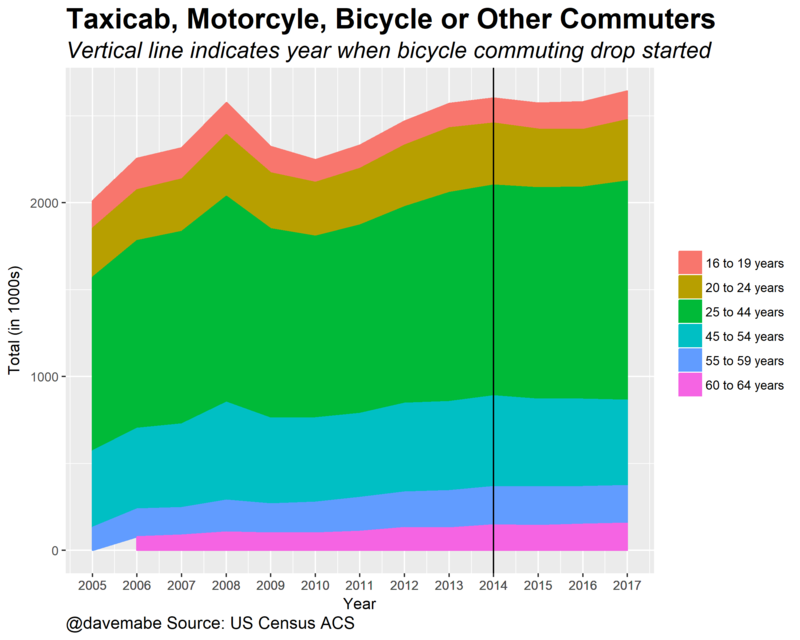 Oddly enough, you can get raw bicycle commuting numbers normally, but when you group by age they are lumped together in a single group with “Taxicab, motorcycle, bicycle, or other means.” This category is increasing over the timeframe of the bicycle decline which as far as I can tell makes this impossible to isolate bicycle commutes unfortunately. If anyone knows how to use the ACS to isolate bicycle commuters please let me know. Here are a couple charts that show the difficulty. Even though there is a drop in bicycle commuting, this larger group is increasing over time. Bicycle commuters are only a small part of this group so it’s hard to tease out any effect here. Those are good ideas. Here’s an additional datapoint: people who work at home earn the most money. Drive alones are second, transit third, and “other” (which includes cycling) well below that. Walking is lowest. So if work-at-homes captured cyclists, it was the high-end cyclists. I’m not sure how many of those there were. A more significant phenomenon: the census form asks people how they “usually” get to work. 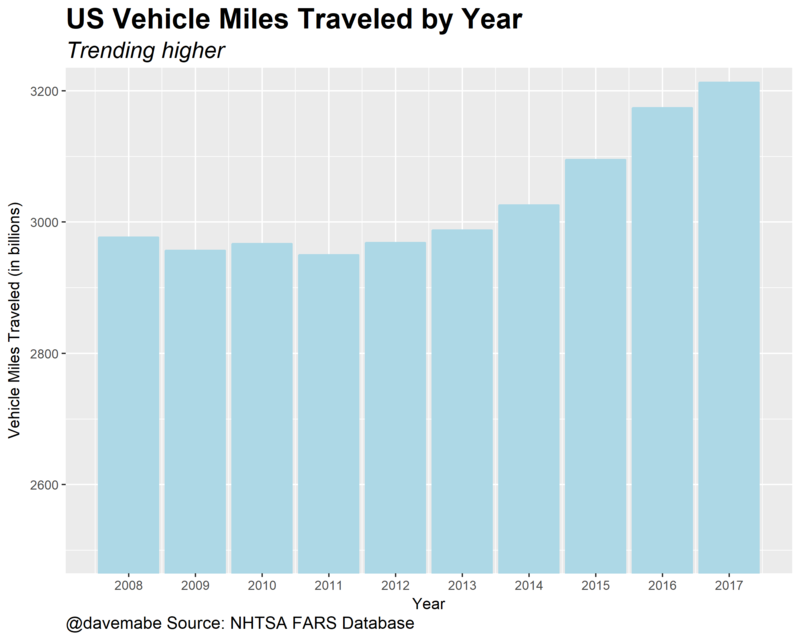 The National Household Travel Survey found that people who usually drive in fact drive 98 percent of the time but people who say they usually bicycle in fact only bicycle 70 percent of the time. Maybe some of those people who bicycled, say, 60 percent of the time in 2014 went to 40 percent in 2017. Randal said a couple things that surprised me here. One is that cyclists as a group earn less money than the average worker. I tried to confirm this with the ACS survey and it’s true that the group that contains bicycle commuters earn less than average, but I suspect that, like age, this is similarly confounded by grouping “Taxicab, motorcycle, bicycle, or other means” together. A quick search shows that in Australia cycling commuters are wealthier than average. I also discovered from survey data from the NC DOT that cyclists that use greenways strongly skew rich and white relative to the local population. Randal’s theory about percentage of time commuting seems to jive with the housing costs theory previously mentioned. 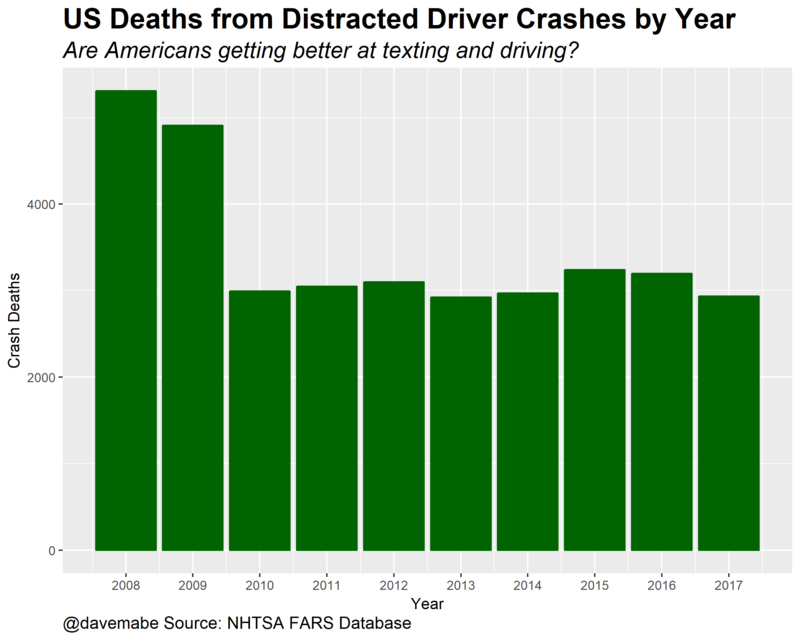 A large number of comments suggested that cycling is, in fact, getting more dangerous over time due to drivers texting, more cars, more cycling-intolerant drivers, etc. I agree that it seems there is a general sense among cyclists that of course it’s getting worse on the roads. This has always struck me as somewhat of a moral panic. I’ve had my share of cars purposely buzzing me on my bike and yelling crazy things at me but I don’t get the sense from my own experience that these incidents are increasing over time. Cycling advocates consistently talk about the large number of people who WOULD bike if they could be made to feel safer on a bicycle. This approach seems to have been successful in getting municipalities to devote resources to large cycling infrastructure projects. The current generation seems to be especially convinced by appeals to safety but there’s a bit of a paradox. If people believe cycling is TOO dangerous they’re not going to do it no matter how good the infrastructure is. (Safety first!) But if people feel that cycling is safe then there isn’t much demand for new infrastructure to be built. Are the roads getting more dangerous over time? I decided to try to answer that question. It doesn’t feel like it to me but let’s look at the data. 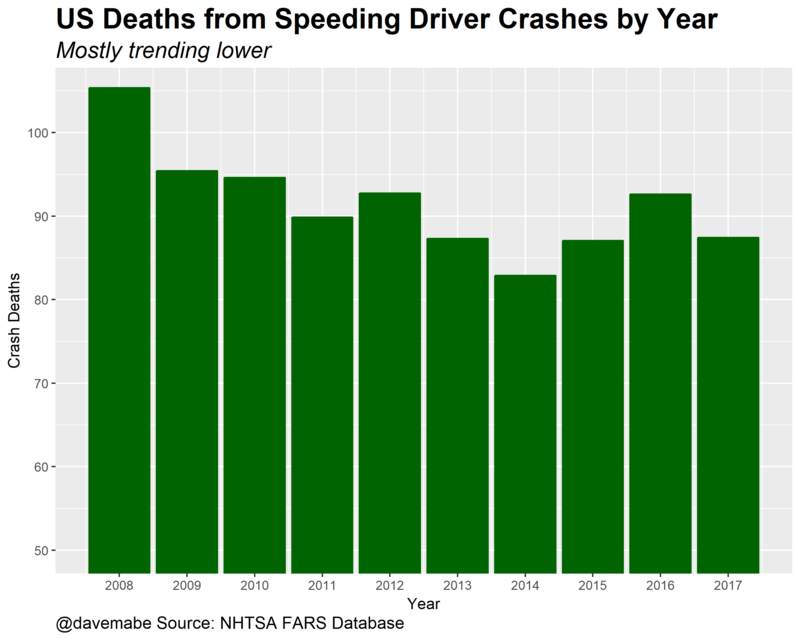 The National Highway Traffic Safety Administration has kept statistics on crashes for a long time. They produce an annual report that has all sorts of data on traffic deaths. 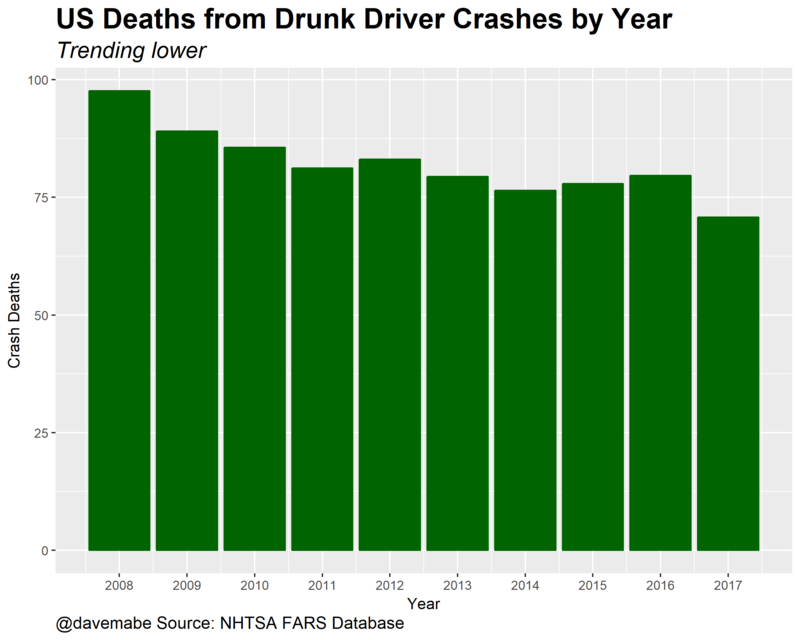 OK, well how about deaths from drunk driving? Are those increasing? No – it turns out they’re way down. What about motorists that exceed the speed limit and cause a crash that kills someone? Getting worse over time? No – those are down too. If we reflexively respond to safety concerns in a thoughtless way we sometimes end up with poor solutions that are sometimes worse than the problem. The post Lance Armstrong cycling era taking effect. I think the high end cycling world has definitely taken a hit – at least anecdotally from my perspective in a cycling heavy area. I’m reasonably confident (65%) USA Cycling could produce some reports based on road race participation over the last decade and it would show a steady decline. Would this have an effect on bicycle commuting? Probably but most likely the effect would be small. Where is the Cycling Ceiling in the US? It ultimately boils down to this for me as I alluded to earlier: how much room is there to grow cycling in the US? Of course I don’t have the answer to this but these numbers make me think that perhaps we’re closer to the ceiling than I would have guessed. And given the headwinds of safety consciousness, housing costs, the price of gas, and the rise of telecommuting, how big could gains from infrastructure improvements be? I’m starting to think about a way to come up with an answer to this question on my own from some other data sources. Look for a post soon. If you believe the drop in bicycle commuting is temporary, I’m offering a bet at 1:1 odds that the bicycle commuting number won’t exceed the number from 2014 in years 2018, 2019, or 2020. Any takers? Send me a DM on Twitter: @davemabe. Previous PostPrevious Commuting by Bicycle is – down?